Bible app is simple, elegant and beautiful. 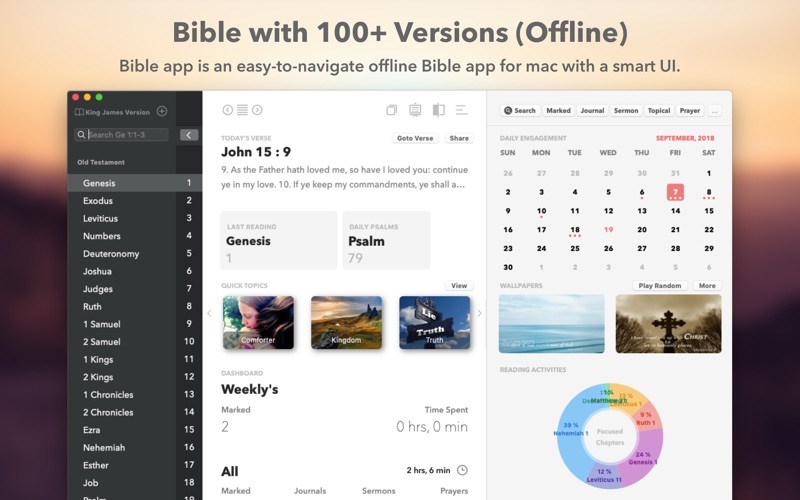 It's an easy to navigate offline Bible app for Mac that has a smart UI and many useful features. It allows you to sneak into the sacred scriptures without the confusion of the Internet. • Search books, verse with chapter and verse number. • Decrease or increase font size. • Choose from 12 background colors to read Bible in the app preference. • Choose from 10 font styles to read Bible in the app preference. • Increase or decrease the speed of speech. • Change the background color of the presentation view. • Hide left pane which the consist book list. • Now search bible with book name, verse number. 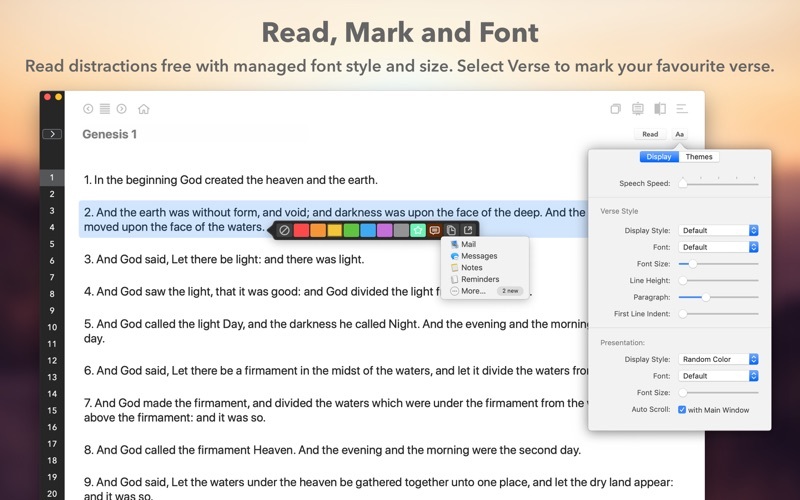 • Find highlighted verses sorted into different colors. • Now save journals into different folders. • Add sermons: Take notes with voice recording. 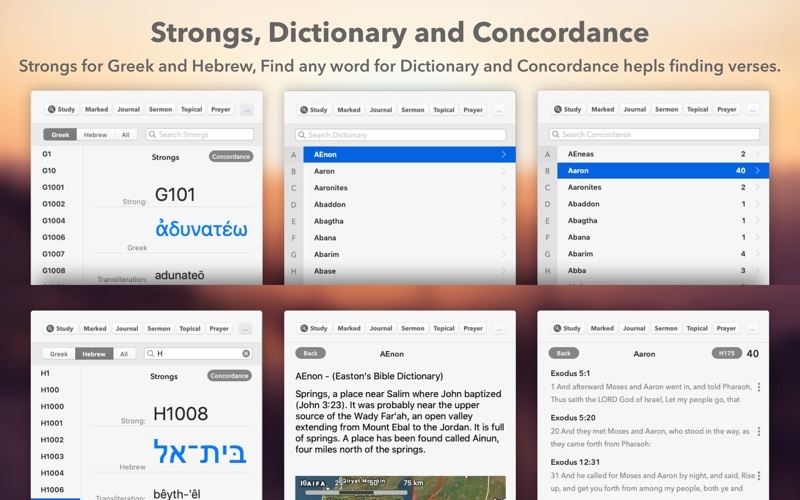 • Bible Concordance is added. • More than 50 new Bible Versions have been added. • At the bottom, character and line counts are added in both Journal and Sermon sections. • You can add attachments (document, photos, files) with each journal and save them in the app. You can view the attached files simply by clicking the thumbnails. 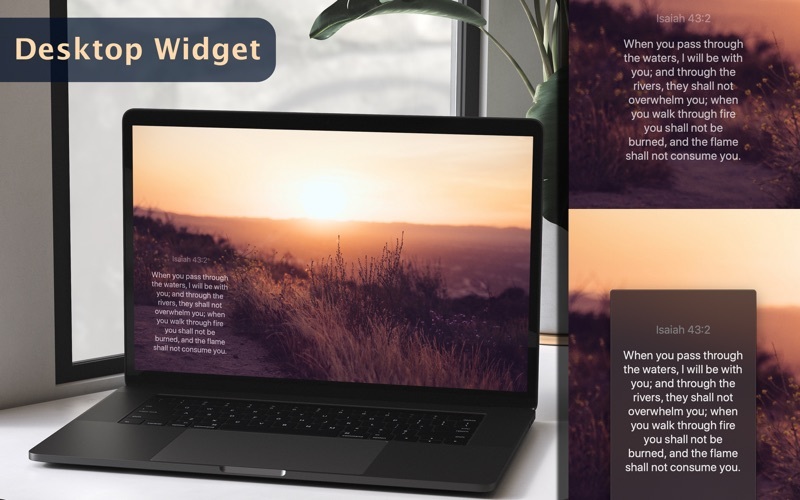 • A desktop Widget is added that shows Daily Verses in two different backgrounds, Light and Dark. • Daily Verse can be accessed in the Notification Center. Users can add the App Extension in Notification Center and browse Daily Verse. • Write Journals or take notes and save them for future reference. • Share Journals via all the available sharing options. 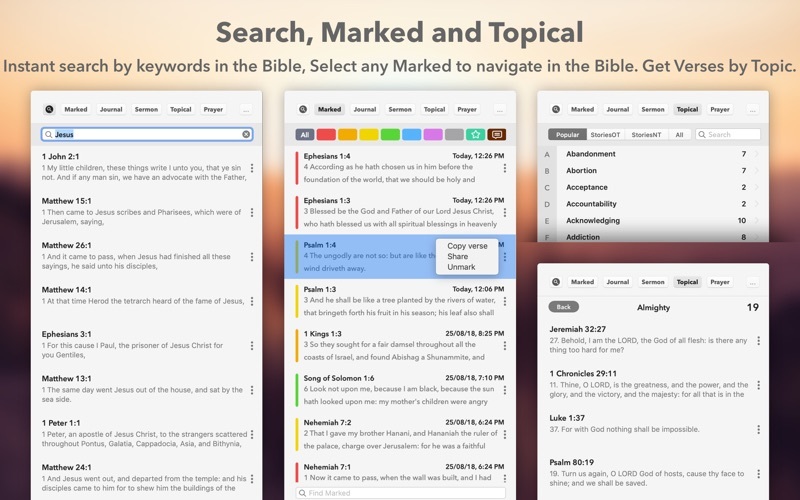 • Search Verse: Search the entire Bible with Keywords and get to a specific Chapter or Book. • Parallel Reading: Open two different Bible Translations side by side and cross-refer. • Option to scroll both Translations together or separately. • Mark Bible Verses as Favorite and browse all of them in one place. • Highlight Bible Verses with Color and browse all of them in one place. • Copy Bible Verse from the app and paste anywhere. 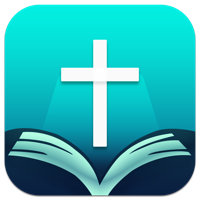 • Daily Verse: Get inspirational Bible quotes daily on a small pop up. • Speak Mode: The Bible reads out Bible Verses for you. • Presentation Mode: Show scriptures from Bible to a projector screen or a secondary monitor in fullscreen. • Trigger Add Journal and Add Sermon window by Hotkey at the Menu bar. 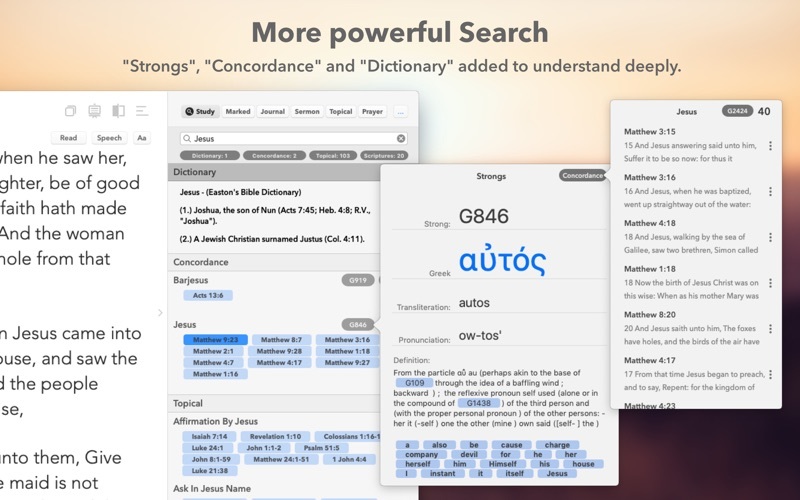 • Spotlight Bible Search: Now search Bible verse, Journal and Sermon entries from a dedicated Search Bar which can be triggered by user-defined Hot Key. Check General Tab in App Preference window. • Now add Sermon quickly from anywhere by pressing a user-defined Hotkey. Setup Hotkey in App Preference. 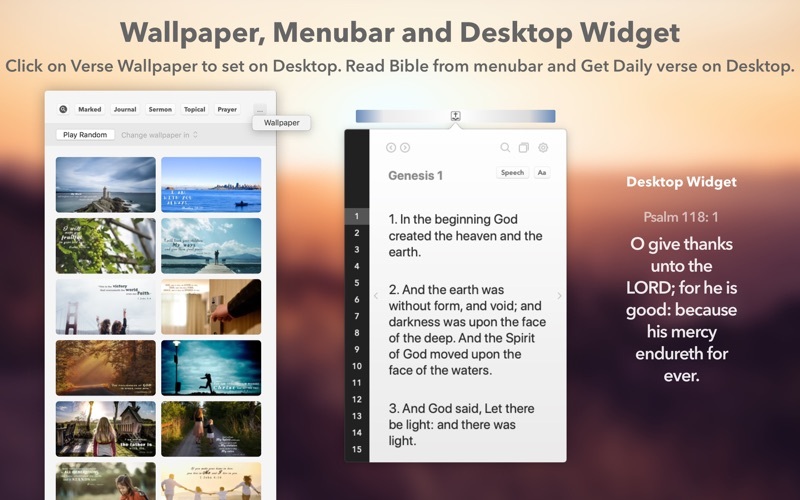 • Open Bible from MenuBar by pressing user-defined Hotkey. Setup Hotkey in App Preference. • Now add Journal quickly from anywhere by pressing a user-defined Hotkey. Setup Hotkey in App Preference. 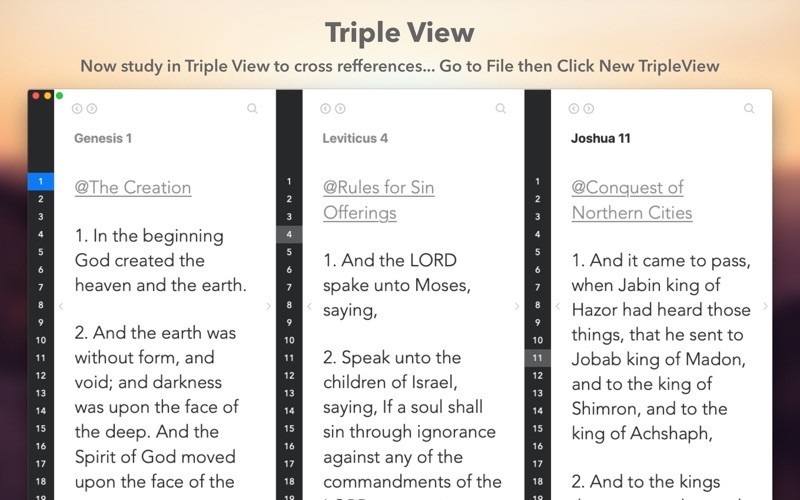 • Bible Translation name is shown in Mini-view mode. 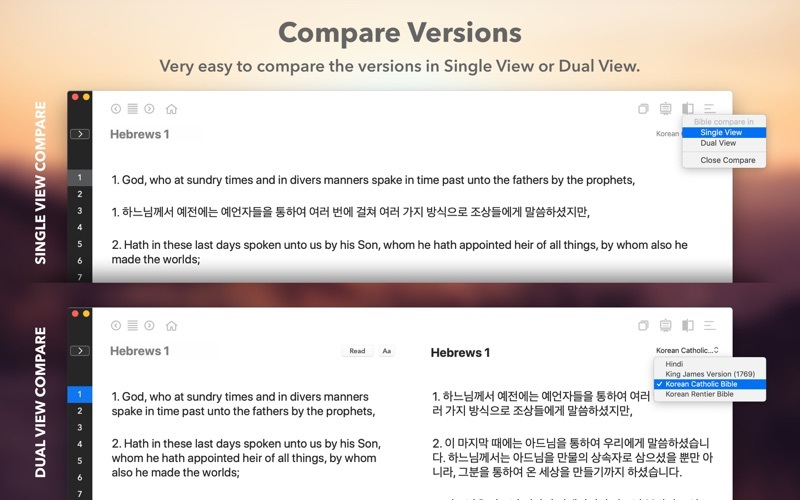 • Improved Single-View Bible comparison between two different Translations. • Highlight and mark Bible Verse as a favorite by using the MacBook Pro Touch Bar. • Now you can schedule prayer meetings with title and description. List down your daily prayers and mark them complete when your wish is fulfilled. We are using CloudKit to store users data. We are not keeping any data on our servers or anywhere, just only using CloudKit. We keep syncing Local CoreData with CloudKit. In the ​Dictionary tab, you can see some location's map. Bible app has made Bible reading easier on Mac. Using the smartly designed UI, users can jump from one chapter to another very quickly without any issue. The powerful Search Verse will help to get your hands on to any chapter or verse in no time.